Zach Johnson's Open triumph capped a memorable championship that told us plenty about the future shape of the game of golf. The 39-year-old American demonstrated that the majors are not the exclusive domain of a big-hitting younger brigade. We can also conclude that as Tiger Woods fades from relevance, Jordan Spieth has become the sport's biggest star. All this in a period where there is a seemingly endless production line of young talent, plus proof that the game's most historic course remains a worthy major venue. While the world's best players become fitter, stronger and more athletic in wielding their state-of-the-art equipment, the Old Course remains a relevant test of golf. Its main defences are the elements and clever pin positions, but the alterations brought in ahead of The Open helped stiffen the exam paper faced by the players. There are potentially eight par fours that are a mere drive and a wedge, yet more often than not it still needed something special to pick up a birdie. The inclement weather helped keep a lid on the scoring but this was still an unusually soft and receptive version of the Old Course. 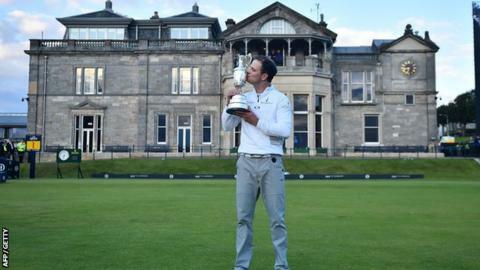 The R&A will have few qualms about returning in six years to celebrate the 150th Open. For four consecutive St Andrews Opens big hitters prevailed, as John Daly (1995), Tiger Woods (2000 and '05) and Louis Oosthuizen (2010) took home the Claret Jug. By contrast Zach Johnson is relatively short off the tee and anchors his success in a razor-sharp short game. It makes a refreshing change to see this type of player succeed in one of the game's four biggest tournaments. It also sends a reminder to those not blessed with prodigious power that it is wiser to stick to your strengths rather than meddle with your swing in search of extra yards. Short-game experts such as Luke Donald and Graeme McDowell should be greatly encouraged by Johnson's victory. You don't say? Of course he is. Just as he is about to turn 22, the young Texan can reflect on a year that has yielded the Masters and the US Open and a St Andrews debut that left him just a stroke shy of a play-off. It was another immense display from Spieth who, for the most part, took on the Old Course with the wisdom of a veteran. His undoing was the naive four-putt on the eighth hole of the final round. Had he properly realised the danger of going long with his first putt he would surely have emerged with a bogey four at worst. However, the way he responded with back-to-back birdies on the next two holes bore the hallmarks of a genuine champion. Then there was the birdie on the 16th to tie the lead and give himself a chance of a historic third major win in a row with just two holes to go. That, in itself, was a huge achievement. That may seem a harsh call but there is little evidence to suggest that Tiger Woods is ready to return to the top of the game. This may prove a swing change too far for the 14-time major champion. If he couldn't make the cut at an Old Course where he has enjoyed so much success then he is seriously struggling. Remember Woods came to Scotland telling us he was ready and confident after an encouraging performance at the Greenbrier two weeks earlier. He went through his usual mantra of telling us he could win, yet such utterances sound ever more delusional. This was the first time he has missed consecutive cuts in majors. It is a very long way back from his current ranking of 258 in the world. Sometimes you have to miss out on a major chance to learn how to win one. Sergio Garcia and Dustin Johnson surely must know what it takes by now, yet neither looks any nearer making the big breakthrough. Both players possess the talent but neither appears to have the mentality to get the job done. Garcia was perfectly placed to surge through the pack last Monday and his peerless ball striking could have been a potentially decisive asset during the homeward battle into a gusty, chill wind. The Spaniard faded from contention in a depressingly familiar way. There is no one better at starting majors than Johnson, yet he becomes a more inhibited figure during the closing rounds. The halfway leader at the Old Course seemed haunted by his US Open near-miss. Next month he goes to Whistling Straits for a PGA Championship where more ghosts await. Five years ago Johnson should have triumphed but for grounding his club in a bunker to incur a two-shot penalty while holding a one-stroke lead. For redemption to come next month he will need to find an inner fortitude that was absent during the closing rounds at St Andrews. By the time Rory McIlroy comes back, Spieth will almost certainly have toppled him from the pinnacle of the world rankings. The chances are the Northern Irishman will be back in action during the PGA Tour play-offs in September. By then Spieth might be a three-time major champion and even if he is not he will be regarded as the man to beat every time he tees it up. This was McIlroy's domain at the start of the year and watching how the 26-year-old reacts will become a fascinating new dynamic for the game.